Bottom trawling, a fishing practice that involves dragging a net along the seabed behind a boat, causes extensive damage that can even be seen from space, a Hawaii scientist reports. "There is a massive amount of mud that gets kicked up," said Les Watling, a professor of zoology at the University of Hawaii. He joined other scientists in a presentation on the problem last week in Boston at the annual meeting of the American Association for the Advancement of Science. Trawling is not a problem in the deep waters around Hawaii, since the method is used in waters less than about a mile deep, but areas where it is used sustain a significant loss of marine life, he said. "It does more harm to the sea floor than any other kind of fishing, and now we have images from space showing how much sediment it lofts into the water column," added Elliot Norse, president of Marine Conservation Biology Institute. The image on the top is from the Mount Desert Rock site. The area has most likely never been trawled and shows abundant life. 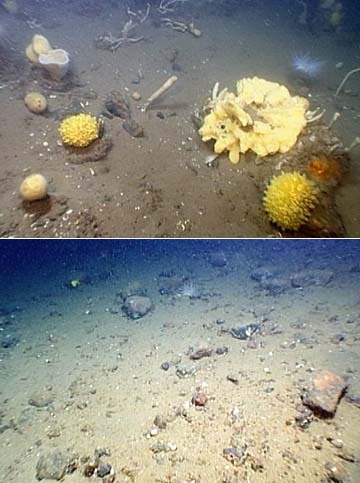 At bottom, an area in the Gulf of Maine called Truxton Swell has been heavily trawled and shows little visible animal life. A University of Hawaii zoologist is among a group of scientists decrying the destructive effects of bottom trawling, a type of fishing, visible in satellite images from space. "We're hoping that people will have a look," said Les Watling, a professor of zoology at the University of Hawaii. "There is a massive amount of mud that gets kicked up." The satellite images of mud trails kicked up by bottom trawling are available on the Web site www.skytruth.org, inside the gallery and labeled as "trawling impacts." Watling, who has been working for about 15 years on limiting the effects of trawling, added that 99 percent of the areas that are trawled cannot be seen by a satellite. He was a panelist in a session that discussed the effects from bottom trawling at the annual meeting of the American Association for the Advancement of Science this month in Boston. Since trawling cannot be done in waters deeper than 6,500 feet, it is not a problem around Hawaii, but in areas where it is used, there is usually a significant loss of marine life, scientists say. Trawling equipment can be about 150 feet across and weigh half a ton. In its wake the trawling nets leave nothing but rubble, killing sponges and coral on the sea floor. Bottom trawling is used to catch shrimp and other bottom fish such as cod. "Trawling removes much of the life from the sea floor," said Elliot Norse, president of Marine Conservation Biology Institute, who participated in the session. "The effect is basically to denude the sea floor." He said bottom trawling catches more unwanted fish and does more harm to the sea floor than any other kind of fishing. The sediment disturbing the water column can also clog fish gills, possibly reintroduce absorbed carbon into the water and kick up toxic materials that have settled to the bottom, Norse said. "Now we have images from space showing how much sediment it lofts into the water column," he said. "Not just affecting the sea floor, it also affects the water column." Ten years ago, Norse and Watling completed a study that found bottom trawling covers an area the size of the continental United States every year. John Amos, president of skytruth.org, used the detail in satellite images from Google Earth to discern the fishing vessels creating the squiggly sediment trails from bottom trawling. He gathered satellite images from the U.S. Geological Survey of fishers using bottom trawling in the Gulf of Mexico and China. "I think that what's exciting about this imagery is it's one of the few examples where we can provide people with visual truth of what we're doing to the oceans," Amos said. "Imagery from space can actually show what we're doing to the bottom of the ocean floor. When you show people images they understand, they get it in ways that thousands of pages of reports doesn't quite communicate." A video comparing trawled and untraweled ecosystems is at www.mcbi.org.